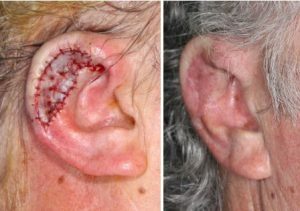 This is the most straightforward technique of closure of a skin defect. 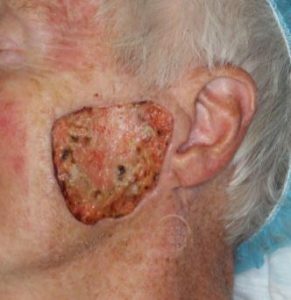 It usually requires additional resection of skin, beyond the necessary margins of excision of a lesion. The resection of skin is done to change the defect shape from a round or an oval into a fusiform shape that can be closed as a line. 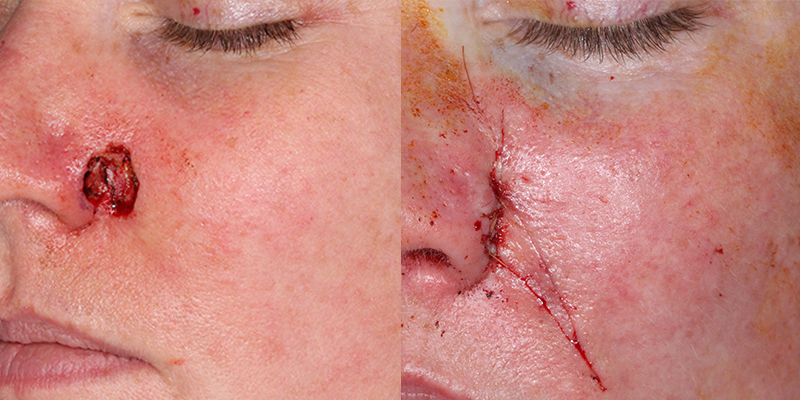 Sutures are used to bring the deep tissue layers together first, followed by more superficial layers of the skin. Traditional external sutures over the line of closure can be used as a final layer. Sometimes, only internal sutures are required to bring the wound edges together. The advantage of linear closure is control of contour. In areas such as the cheek, flaps can be a disadvantage because they can result in small hills and valleys due to different tension along the flap edges. In a linear closure, contour is easier to control as tension of closure varies along a sraight line in a predictable fashion. The ends of the closure have less tension, while the center has more. The greater the tension along a convex shape, such as the cheek, the greater the flattening of the cheek curve. At the ends of linear closure, an opposite effect occurs - bulging of tissue resulting in a more convex appearance. This is also called standing cone deformity or dog-ear deformity. The bulging of tissues can be exaggerated if the ends of the fusiform closure are not tapered enough. In other words, a 10 degree angle closes with less bulging than a 30 degree angle. To achieve a smaller angle with less bulging, the fusiform excision has to extend further away from the original defect. This creates a longer scar. The balance between contour control and length of scar is the challenge in linear closure. Longer scars have better countour, while shorter scars have a tendency to bulge at the ends. Visual assessment of this balance at the time of reconstruction is hampered by swelling and tension temporarily exaggerated with sutures. 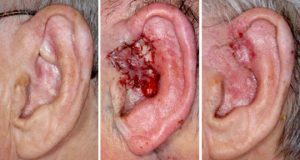 Early after linear closure, bulging at ends can be visible but should resolve within 6-10 weeks as the scar and tension dissipate.